Eye On Tampa Bay: Can Performance Audit For Massive Transit Tax Hike Be Done By Deadline To Put on November Ballot? Can Performance Audit For Massive Transit Tax Hike Be Done By Deadline To Put on November Ballot? We posted here about the performance audit now required to be completed and published 60 days prior to the election for any local referendum that gets on the ballot - no matter how the referendum gets on the ballot. The petitions are still being validated by the SOE. We expect the required number of valid petitions will be reached and the SOE will certify to the county commissioners shortly. 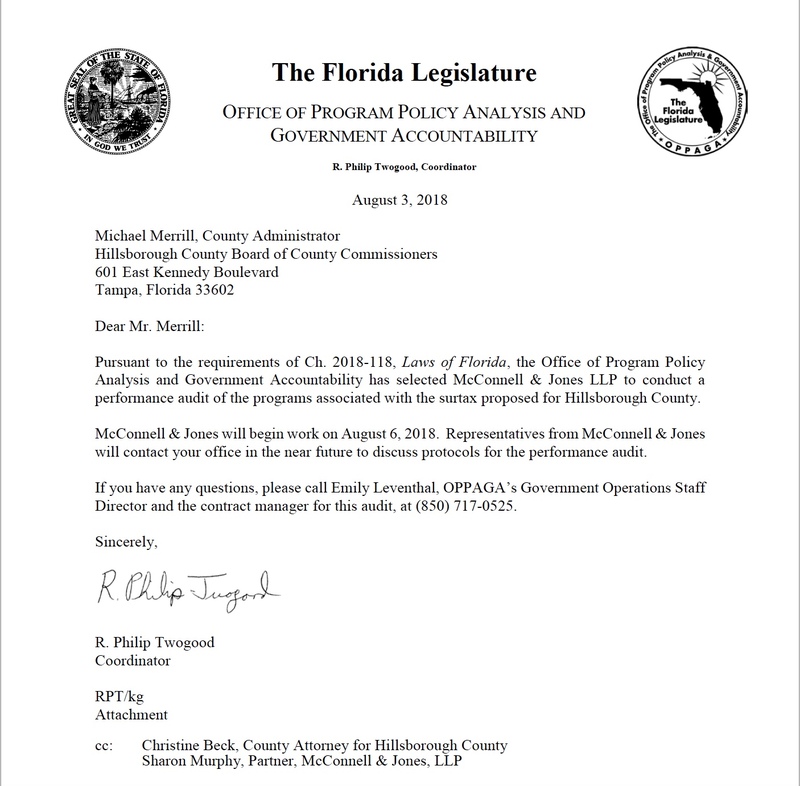 OPPAGA notified Hillsborough County on Friday, August 3, 2018 they have hired an auditor to begin the audit process. Prospects for a Nov. 6 referendum are shaky at best, as a new state law requires the district first to undergo a state performance audit. That process, including two months to post the results, could take eight months. 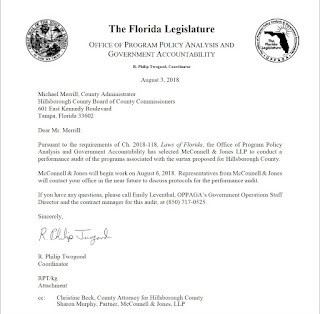 For any referendum held on or after March 23, 2018, to adopt a discretionary sales surtax under this section, an independent certified public accountant licensed pursuant to chapter 473 shall conduct a performance audit of the program associated with the surtax adoption proposed by the county or school district. 1. The economy, efficiency, or effectiveness of the program. 2. The structure or design of the program to accomplish its goals and objectives. 3. Alternative methods of providing program services or products. 4. Goals, objectives, and performance measures used by the program to monitor and report program accomplishments. 5. The accuracy or adequacy of public documents, reports, and requests prepared by the county or school district which relate to the program. 6. Compliance of the program with appropriate policies, rules, and laws. There are multiple programs associated with Vinik's massive 30 year $15-18 BILLION transit tax hike. There are transit programs, road programs, planning programs. These multiple programs are across multiple entities - the county, the city municipalities, HART and the MPO. In addition, this 14% sales tax hike referendum grows government. It creates another government transportation bureaucracy that usurps power from duly elected county commissioners, city council reps and the governing HART Board of the special taxing district for the local transit agency HART - for 30 years. We know who wrote the ballot summary and the five pages of fine print in the lengthy petition that many probably never read. All the bureaucratic and regulatory burdens baked into the monster 14% transit tax hike were intentional because they benefit - for 30 years - those who wrote them. We doubt the regulatory gobbly gook was written with any thought that an audit would be required. The special interest, eight percent sales tax proposal over 30 years, Davison asserted, is an attack on unincorporated areas and Hillsborough County’s smaller cities. Tampa reaps the benefits with 27 percent of the county population siphoning 53 percent of the tax receipts. Audits are very methodical. To do any audit, it takes time to plan, time to do the field work and time to complete the audit report. Is it possible that a performance audit for a complex $15-18 BILLION tax hike referendum that includes multiple programs can be completed and the report published in about 30 days? What happens to this transit tax hike petition effort if the audit is not completed and published by the 60 day pre-November election deadline? The Eye will be watching!